Includes: bra, skirt, sleve, arm band, wrist cuff, necklace, headband, half-circle chiffon veil. Fabric: cornflower blue lycra, metallic royal blue lycra, blue lace, purple/lilac print chiffon. 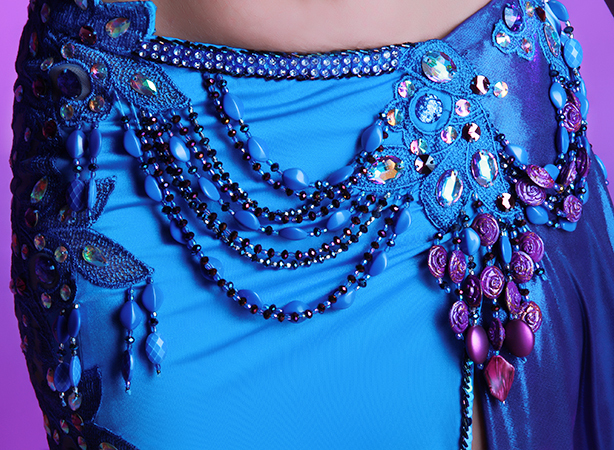 Beading: blue and purple, AB crystal stones and colored stones. Skirt: fitted lycra skirt with two slits in front (one short and one long with metallic lycra panel). Chiffon tail on the back. Lace insert over one hip. Upper hip 34", lower hip 38", length 40".